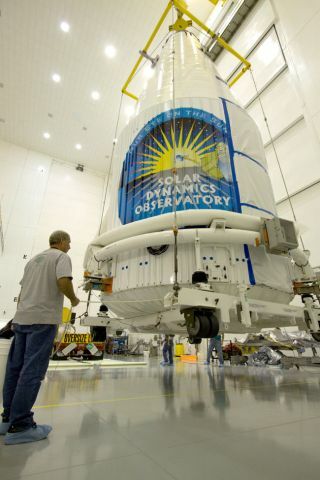 At the Astrotech Space Operations facility in Titusville, Fla., NASA's Solar Dynamics Observatory (SDO), enclosed in the Atlas V payload fairing, is lifted off the floor. Workers are preparing to lift SDO onto a transporter in the airlock. SDO is the first mission in NASA's Living With a Star Program and is designed to study the causes of solar variability and its impacts on Earth. SDO's all-seeing eyes will stream the data equivalent of half-a-million songs per day down to a ground station, as the observatory maintains a geosynchronous orbit above the same point on the Earth's surface. That comes to 150 million bits of data per second, 24 hours a day and seven days a week — almost 50 times more science data than any other mission in NASA's history. Science won't prove the only beneficiary here. Better knowledge of the sun's behavior would go a long way toward alerting Earth of possibly catastrophic solar storms that could cripple power grids and communication systems across the globe. "It will be like the early days of weather forecasting," said Dean Pesnell, SDO Project Scientist at NASA Goddard Space Flight Center. The solar observatory carries a group of multi-wavelength telescopes and cameras known as the Atmospheric Imaging Assembly (AIA), which represents the equivalent of an IMAX camera for the sun. The telescopes and cameras can capture an HD image of the sun in eight out of 10 available wavelengths every 10 seconds, including nine ultraviolet or extreme ultraviolet bands and one visible-light band. Continuous HD observation of the sun's coronal atmosphere means that scientists can track changing patterns in the corona regardless of changing temperatures, whereas older solar observatories may lose sight of a coronal structure when it shifts to a different wavelength. That means scientists can get a much better idea of what affects solar flares and coronal eruptions, as well as how the sun's magnetic field changes during all the events. "Coronal instrumentation before SDO could either see things sharply over a limited field of view or rather poorly over the full Sun, and then only when the light-emitting gases stayed in a limited range of temperatures — which they generally do not," Guhathakurta told SPACE.com. A second instrument called the Helioseismic and Magnetic Imager (HMI) can measure the magnetic field's vector anywhere on the visible face of the sun, and allow scientists to gauge the electric currents running through the solar corona. Knowing the pattern of the electric currents should also help understanding what magnetic activity can lead to flares and eruptions, Guhathakurta explained. The third instrument, known as the Extreme Ultraviolet Variability Experiment (EVE), can precisely measure ultraviolet emissions from the solar atmosphere across the entire range of temperatures covered by AIA's telescopes and cameras. In that way, EVE serves as an independent check of how the sun's restless magnetic activity can lead to changing amounts of X-rays or extreme ultraviolet radiation reaching the Earth's atmosphere. "Solar flares in the extreme ultraviolet could be one of the new things that SDO contributes to space weather [knowledge]," said Pesnell at NASA Goddard. "They are not as energetic as X-ray flares but could affect the atmosphere." The solar observatory's initial mission is scheduled to wrap up in five years, but Pesnell and other scientists remain hopeful that it can continue for much longer. SDO should reach orbit with enough fuel to last for 10 years, and none of the instruments have parts that would wear out. A 10-year observation span would also provide a full look at the sun's changes during the rise to solar maximum, and then decline to solar minimum. The rise to solar maximum involves a period of small sunspots that don't last, while the decline to solar minimum sees many large, long-lived regions of activity and the appearance of mysterious coronal holes. "I think the extended mission will be as interesting as the initial five years," Pesnell said.